I travel quite a bit for my job and I want your opinion and your readers’ opinions on whether it is more important to have the NOAA weather radio stations or shortwave radio (with or without SSB), in a compact travel emergency radio. 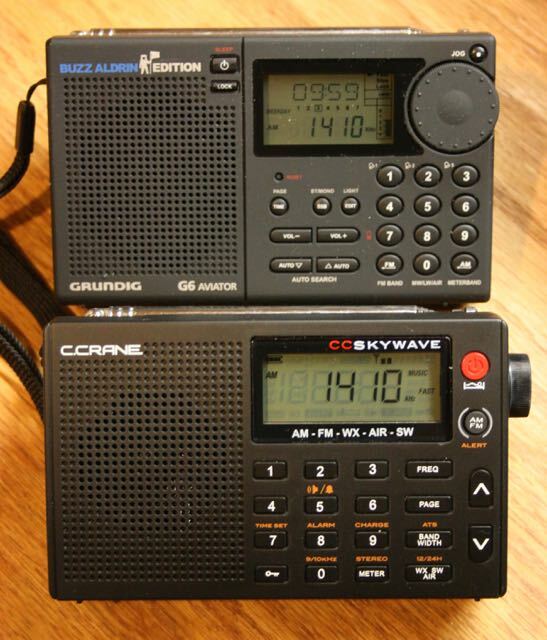 At this point I’m trying to decide between the CCrane Skywave and the Grundig G6 Aviator. Any input would really be appreciated. Ah, the travel radio! One of my favorite topics, Neil. A great little unit, albeit no longer in production; you can buy a used unit on eBay or similar sites. A quick eBay search reveals that prices vary between about $75-150 US. Note: Personally, I believe anything over $80 shipped is probably asking too much for a used G6. Like other Grundig portables of the era, the G6’s rubberized coating will eventually become sticky/tacky. But fortunately, we’ve posted a few proven remedies. 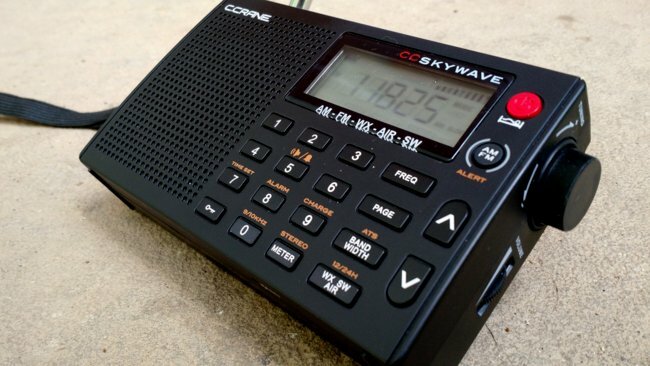 Since the CC Skywave hit the market, it’s been my go-to portable for travel at least 80% of the time. Of course, I still pack the Grundig G6 occasionally, and even my Sony ICF-SW100. Personally I prefer the Skywave because, frankly, it’s just better tailored to one-bag travel. I like listening to the airport tower and other comms while traveling. Since most of my travel is in North America, I appreciate the weather radio frequencies as well. I suppose if all of my travels were outside North America, I might lean slightly toward the Grundig G6 just so I could have the added benefit of SSB reception. In truth, however, I rarely listen to SSB while traveling. SSB may possibly be useful during civil/communication emergencies. If SSB reception and portability is important to you, another radio worth considering would be the CountyComm GP5-SSB–though, like the G6, it also lacks weather frequencies. Grab a CC Skywave. It’s a great performer, very compact, and–unlike the Grundig G6–is currently in production. I’d only buy a new CC Skywave, however, since some of the early models were prone to overloading. The current production run incorporates an update which remedies this. Post readers: Please comment with your thoughts and suggestions! 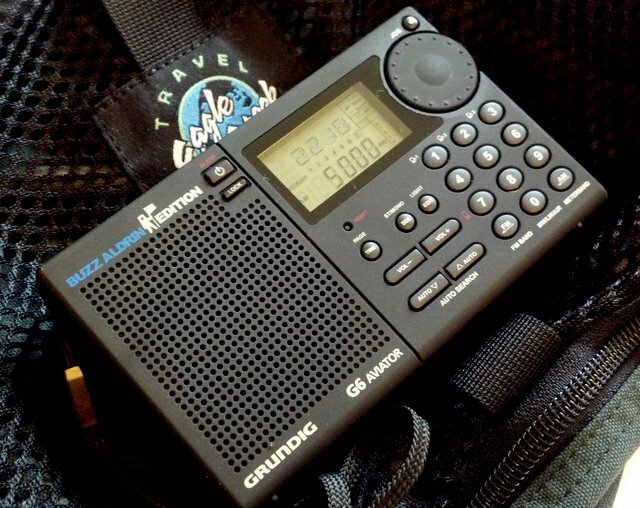 What radio do you pack for travels, and why? This entry was posted in News, Reviews, Shortwave Radio, Travel and tagged C.Crane CC Skywave, CC Skywave, CC Skywave vs Grundig G6, G6, Grundig G6, Neil Bernstein on July 24, 2016 by Thomas. Great information. Thanks everyone for your feedback. It is really appreciated. I have used the Grundig G5 and the Sony 7600 for many years while traveling the world. NOAA is of lesser interest as the internet is a great source of weather information. If you are in the mountains or outside of internet range, I imagine that having wx is useful. But frankly that was much more important in the nineties than today. I have found the G5 to be quite sensitive on all bands, although the external antenna only works on HF. For LF and AM broadcast, you are stuck with the internal loop antenna. Not ideal for DXing on those bands. However, the G5 sensitivity and selectivity are fine for listening to international shortwave. There is much less of that available today, so hams are increasingly the most interesting thing on short wave. And for them, you need a BFO. I can’t imagine a rx without the ability to listen to SSB or CW. I guess that my age is behind this. Having any shortwave receiver is better than none while traveling. A portable long wire seems quite adequate for the G5 if one wants to hear outside of North America. And for my money, a BFO is mandatory. It allows one to listen for beacons, hams on SSB and if you can copy it, CW. “Just an amazing radio for its size. MW performance is far better than I would have expected due to the constraints placed on the size of the LW/MW ferrite rod. It’s been a long time since I did much MW DXing but I gave it a shot one night when conditions were good and the little radio managed to hear everything my other larger portables did. FM performance is surprisingly good, with the G6 holding its own against its much bigger brother the Grundig Satellit 750! Shortwave performance is very good with good sensitivity and selectivity. The single bandwidth is well chosen and does a good job warding off adjacent channel interference. SSB is surprisingly good. Actually for a receiver this size it’s surprising that it has SSB capabilities to begin with! The most surprising thing about the SSB is that there’s no separate fine tuning control, instead the main tuning control starts moving at an amazingly small 20 Hz step! Still, there’s only an SSB button so there’s no way to select upper or lower sideband. I really haven’t found much on LW in my area on any receiver so I haven’t been able to test that. The air band is ok but that’s an area in which I have little interest, and frankly better fodder for a scanner. In addition to this, I want to point out that there are many smartphone apps (at least for the iPhone, most likely for Android) that are geared towards shortwave, including apps that will decode digital transmissions of many types and even decode CW. Naturally you need ssb capabilities for this, and the G6’s 20 Hz step in SSB mode is perfect for this. The apps run from free to about $3, a far cry from the high cost of the hardware once required. This is my favorite pocket portable by a wide margin. NOAA weather radio is not a priority for my travel radios. I use the NWS sites on my smart phone or nearby broadcast stations for weather. My first choice for a travel radio is the Sangean ATS-909X with the ANT-60 reel-up wire antenna. The 909X is not a small portable but I put a high value on its sound quality and the substantial catalog of SW stations and frequencies that I have entered into its memory. I can’t possibly remember all of those stations/freqs myself and I don’t want to pack a WRTH along. The 909X is hard to beat for FM (including RDS) and the AM broadcast band is pretty hot. In those rare instances when I don’t have room to pack the 909X I opt for a much smaller 20 year-old Radio Shack DX-399 (rebranded Sangean ATS-606). The DX-399 still works perfectly after all of these years but the sound is tinny compared to the 909X and it lacks SSB ability. DX-399 also features an external antenna jack. I have used NOAA weather for years on my VHF marine radio. It’s a very useful service but I’m often frustrated listening to 10 minutes or more of regional weather reports before the local report I want is read. During that 10 minutes or more my pea brain filters out the droning NOAA robot voice and I usually miss the local weather. I can hear weather read every 10 minutes by a real person on my local AM news station without induced attention deficits. To be fair, I’ve noticed the same thing with commercial AM stations, waiting so “long” for the weather, I miss it. As I think I said in a reply to some older post, some FRS walkie talkies include weatherradio reception. I’ve ended up with two pairs for five dollars each that get the weather channels. Not as compact as built into a shortwave radio, but smaller and better than the weatherradio section of my Grundig windup radio (the one that is analog and tunes the tv audio channels too, or did before dtv). I keep hoping to find some schedule for the weather radio broadcasts, so I can tune in for the weather I want and miss the other stuff. I am fortunate enough to have one of the few remaining 24/7 all news stations (KCBS) in range all day long. They use the time-honored AM programming practice of running traffic and weather on a programming clock. Thus, with an accurate watch or clock in the car and “Traffic and Weather on the Eights” I never miss one of the six weather broadcasts per hour. I don’t think the NOAA stations run a clock like that. Urh-uh. There are only a few SW pages these days. Why not cut them out? There is also the lightweight CDROM, or even the dowloadable CDrom version for a USB thumb drive. There are “only a few” WRTH SW pages only if the International Radio SW broadcaster B schedule pages are required for use during half of the year. Listeners into SW DXing need the National Radio SW pages too and the B schedules for both during the rest of the year. A lightweight CD ROM is of use only if you are packing along the additional bulk of a device equipped with a CD ROM drive. Likewise, a memory stick is only as small as the device that uses it. It would be nice if multiband radios came equipped to use micro SD cards with standardized open source radio station databases that could be loaded directly into radio tuning memories but they don’t and I don’t suspect that they will for quite some time, if ever. Manual data entry of station information into multiband radio memories seems to be the current state of the art. I am selective regarding the station entries saved on my radio. I don’t enter listing for stations I never listen to (fundamentalist Christian broadcasters, wingnut ranters and foreign language talk stations beyond my linguistic ability), jammers, OTH, numbers stations, hams or low-powered distant stations that I am not likely to ever receive. I do keep a few memory pages set aside specifically for stations that I have never heard or rarely hear and want to hear more often. These pages allow me to do quick scans for the elusive SW prizes. I have 2 G6. One has been locked up for more than a year, batteries out. By locked-up, the keyboard is locked and the little [key] icon appears when I put batteries in. The second works, but something shakes around inside, I am guessing the ferrite bar. This one also had the wheel, so I could find stations, but could not use the “fine tuning” wheel to change the “on-time” limits. Annoying when the limit shows 5 minutes before shutoff and you can’t change it. Airbands have tremendous ‘echos’ (images) of lower AM stations, though these are not centred on many of the ground- and air-control frequencies. G6 has a nice multiple memory banks so you can put frequencies in, if you don’t carry a card with your favourite stations. I thought it would be a smaller version of the great Sonys, but Grundig is not reliable. Travel radio? Anything you can travel with. But you might not be able to get the stations you want, unless you want to miss sleep, or have yet to learn languages other than English. Have you tried holding the lock key on the front for a few seconds? Thats what locks and unlocks the radio. If that fails and it’s truly broken, any chance you’d sell the tuning knob off of it? I lost mine and can’t find a replacement anywhere. Yes, I know the lock button. But it doesn’t work. I had hoped that several months of no batteries would drain the capacitor that might set the radio computers. No go. Tuning knob on the G6? Any piece of plastic with a hole in the middle will work. Maybe a old pill-bottle cap. The socket where the G6 “tuning knob” is will give you all the dimensions of width, depth. It depends on where I am traveling. If it’s within North America, the CC Skywave is a no-brainer. More sensitive and far more selective than the G6 (and I do have both). But, the lack of SSB and LW might make me think twice about choosing the Skywave if going to the Eastern Hemisphere, where the weather band function would also be useless. One last note: the selectivity of the Skywave is so much better than that of the G6, it is remarkable. I know that this is a SW enthusiasts’ blog, but I also like to dx the FM band and the Skywave absolutely kills the G6 in both sensitivity and selectivity! It’s no contest, you’ll hear stations on the Skywave that will never come in with the G6. The aviation band reception on the Skywave is also significantly better than that of the G6. By the way, the Sony ICF-SW7600GR is wonderful for AM and SW and absolutely useless for FM – truly pitiful. Which is why I never travel with it. I prefer a radio that offers the best reception of all three bands. I have to echo Bob’s sentiments here. I own both the G6 & Skywave and for my North America travels, the Skywave works best on all bands. Scanning is much, much faster and the performance of the Skywave’s WX band far outweighs the SSB reception of the G6. The G6 is a great radio, but it lacks DSP and most of the tuning methods the Skywave gives you. The G6 has a warmer speaker, but the Skywave gives you analog volume, which is better at lower levels. Add bandwidth filters and the CCrane ear buds and it’s a better travel package. I too enjoy DXing the FM band and all Sony’s have horrible filtering. (Even Grundig’s G5 has better selectivity.) It’s 20 year old technology. I still use it for SSB & occasional AM DXing, but it’s a “larger” radio. I can pack the Skywave & add the PL-360 for the same displacement in my go bag! While doing a quick comparison of MW on the G6, Skywave, G5 & 7600GR, I was reminded that my G6 seems more sensitive on the lower end (540-1100kc) than frequencies up to 1700. The other radios mentioned here are very consistent throughout the AM band. And it’s not just the signal meter, I can hear the noise level rise. Anyone else notice this? I use my Sony ICF-SW7600GR when traveling. It’s been a pretty good performer and has SSB. However, like Thomas I don’t listen to much SSB on the road. It doesn’t have the NOAA reception but I also carry my 2 meter ICOM V80 which does, in my Pack-Rat bag. Personally, I don’t need weather information when traveling on my emergency radio as there are other mediums to receive it on such as television, am/fm, or the net. My tried and true travel radio is the Tecsun PL- 660. With Air band, SSB cabinilities, and Synch control. Itis my go to radio.